Actually, we're back in the US now - but we've just spent three days in Canada. Tick off another country! 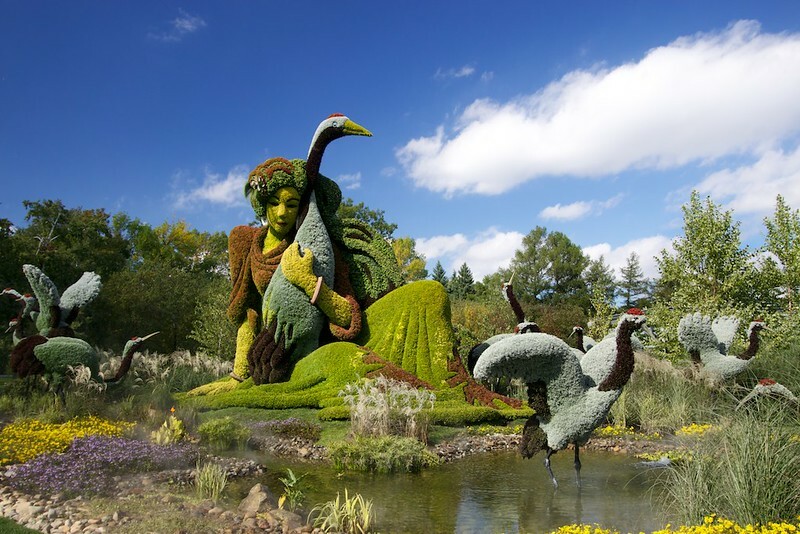 We were lucky enough to be in Montreal for the Mosaiculture though (pure chance) which is where the above picture is from. Very, very large topiary for the un-initiated. Quite cool if quite busy. Our first day was spent exploring this and the Biodome, which happens to be one of the models from Brick City. What was the Olympic cycling venue is now a cross between the Eden project and a zoo. Sadly it seemed that most of the animals were asleep, so my pictures are a little light - but Mrs E did better, so I'll link to her flickr sets once they are published. One thing I did find strange was that when converted, it didn't seem that the new architects really paid any attention to the history of the building. In fact, if you didn't know its' history then you'd be fully forgiven for not knowing anything about it. A shame if you ask me, and I suspect if it were converted today (it was opened in its' present form in 1992) a more sensitive conversion would have been made. Perhaps. Anyway, after walking for 6 miles around the Olympic site, we decided to make our way back. That turned out to be a sensible plan as on our second day we decided to investigate the underground city and see if it could take us into the old town. It turns out it could, but that was quite a hike too! Pretty amazing though, to travel for miles through malls, stations and buildings without ever going outside. We ended up in the old town and took advantage of the sun to sit in a park by the port and read some good books. Verdict on Montreal? OK, but to be honest neither of us were really 'feeling it'. As one of the TripAdvisor reviews said of the Basilica 'It was built in 1824 - that's archeology right there'. Well, no, it's not really. Our house is older than that! I guess that's one of the downsides of living in Edinburgh, we are a little spoilt for history and ancient buildings. Montreal to me was nice, but homogenised like so many other north american cities. Take away the language and we could have just as easily been so many other places. So, combined with a fairly crappy Sofitel experience - not so positive on Montreal. The 2013 Elsmore Grand tour - roadtrip!